Strawberry pretzel parfait has all of my favorite flavors in one glass: salty, creamy, sweet and crunchy! Strawberry Pretzel Salad is one of my weaknesses in this life. If you’ve never had the Jello-encased, Cool-Whip cloaked dream, it’s okay. You probably don’t live in the South. That’s also okay. I made you a quick version here so that you can get all the same flavors in way less time. Let me recap it for you, in case you’re a strawberry pretzel salad rookie: it’s usually made of strawberries trapped in strawberry flavored jello, on top of a crushed pretzel crust with a thick crown of Cool Whip. (And why it didn’t make this list of classic Southern desserts, I’ll never understand). But, for obvious reasons, my version is a little different. Okay, a lot different. My version of strawberry pretzel parfait is made of layers of brown sugar-sweetened yogurt, macerated strawberries (the fancy word for soaking fresh fruit in a touch of sugar), and crushed pretzels with a pinch of cinnamon. If creamy, sweet, salty, and crunchy all in one glass sounds delicious to you (do you have a pulse? ), then you want this. The thing about strawberry pretzel parfait is the salt, man. It’s always the salt. The salty pretzels play so well with the sweet strawberries, and oh, the cream. Let’s not forget the cream! However. I used yogurt instead of cream. I stirred a little brown sugar into full fat plain yogurt for this parfait. Yes, full fat yogurt! Do not be afraid! I mean, the one I use clocks in around 4% fat, which is only double the 2% milk that I put in my coffee and tea. I like to think blurring the lines between breakfast and dessert is my calling in life, and this strawberry pretzel parfait is my latest masterpiece. It serves two (in two pretty wine glasses), but feel free to double or triple it to serve your crowd. Place the strawberries in a shallow dish and sprinkle the granulated sugar on top. Stir to combine. Let sit for at least 30 minutes. Meanwhile, add the pretzels to a food processor. Pulse until they are broken into small chunks. Some will pulverize, some will stay chunky. It's all good. In a small bowl, add the yogurt or sour cream and brown sugar. Whisk together to break up any brown sugar lumps. It's best to eat this right after it's made; the pretzels quickly become soggy. Purrrrfect for a Sunday evening snack for Jerry and me. The ingredients are on my shopping list. Yum. I love the salty sweet flavor combo!! This is so pretty and perfect for summer! My favorite desserts always include both sweet and salty elements. I love this. I’ve never had strawberry pretzel salad but I love a good sweet and salty dessert. These little parfaits are adorable, love that they can be breakfast! Oh baby is right.. Love this twist on that classic pie.. Strawberry pretzel salad is one of my husband’s favorites. Love that you use yogurt for these parfaits! I’ll have to make these for him soon! OMG strawberry pretzel salad. Just flashed back to every family reunion! Love that you just transformed this for breakfast. And really, once you’ve done the full-fat yogurt thang, there’s no going back. Great twist on a classic. These are beautiful! I can’t believe I’ve never heard of strawberry pretzel salad, although to be fair I’ve never lived below the Mason Dixon line. But it sounds like I’ve been missing out! Good thing I have all the ingredients to mix this up later today! I think your version of this dessert is my favorite ever!!!! This one totally made me smile, Christina – I always love the church ladies and their desserts, although yours looks better. oh the best combo ever. Clearly I need to go to church and find me a blue haried lady because I’ve never had strawberry pretzel salad and I don’t mind jell-o so much ;) I love what happens when you’re craving salty/sweet – these parfaits look awesome! It’s all about desserts for breakfast or breakfast for dessert on our blogs at the moment it would seem! 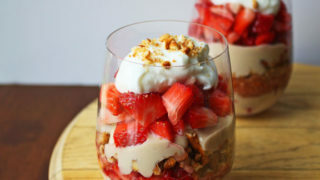 I love the idea of creamy yoghurt with crunchy pretzels and sweet strawberries, yum! One of my roomies made this for me in college and I kid you not it was gone that same night. I’m pretty sure that the three of us ate a whole pan PER NIGHT for 2 weeks straight! This looks amazing!!! So simple.. Love the saltiness from the pretzels! Those adorable little ol’ blue hairs totally know what they’re doing. I loved parfaits like these – you can’t have a summer picnic or family BBQ without it. Oh the myriad of foods that can only be found south of the Mason-Dixon. Southern blue-haired ladies definitely have better recipes than northern blue-haired ladies. But that probably didn’t even need to be said. Oh my goodness! I’ve never made-or eaten-that salad with strawberries-I use peaches and peach Jell-O and it’s delicious. My husband suggested making it into a pie…….I like this idea much better. The strawberries are getting better at the store-I can’t wait to try this. 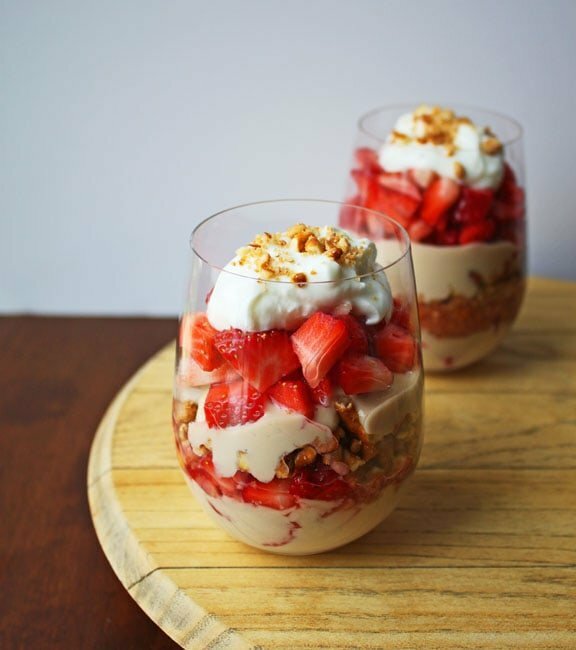 I have never had strawberry pretzel salad, but dang it, these parfaits look lovely! I am totally swooning over here! Strawberries and pretzels… together?! I waaaaaaaaaant one! pass me a fork (or a spoon?) love the combination of sweet and salty! mmmm love this! A great southern staple! Oh baby! I need some of that creamy goodness for sure!!! I love that you made this into a breakfast food!!! It is gorgeous!!! I love everything about this recipe. Great idea to add pretzels! What a great healthy snack!!! Yessss! I love everything about this! It kind of reminds me of this dish my mom makes with pretzels, strawberry jell-o, and a cream cheese layer!!! Except way easier!!! I LOVE that pretzel salad!! This is a much better version though- full fat yogurt sounds like the way to go. Love this Christina! Missouri is on the Mason-Dixon line. We are familiar with this scrumptious dessert/salad in our neck of the woods. Nice to have you come up with a pint size version. How fun! I especially love the pretzel twist! Such a great update of a classic. This looks like the perfect summer dessert. I love your breakfast version of this salad! Everything is more fun when layered into a parfait anyway. Especially when it involves getting to eat dessert for breakfast! I love the sound of strawberries and pretzels! I need some of this right now! Wow! I’ve never thought to use pretzels in parfaits and I cannot wait to try this! This looks so good, Christina! I would love to serve these sweet-salty parfaits next time I have a spring party! In the midwest we are also fans of calling whipped topping mixtures “salads” and I think it’s so funny! Have you had Snicker Salad in Kansas yet? Anyway, I’m not a huge fan of strawberry pretzel dessert, but I think I could totally get behind your version with full fat yogurt. Love! I am so overdue on telling you this, but I am so inspired by this blog post in particular! My mom makes a mean strawberry pretzel salad, so I immediately thought of her. Maybe it will be in the works for Mother’s Day! Toodles! OMG!!!! Those look soooo yummy! Going to have to make these!!! Delish! As a 30 yr Weight Watcher veteran, I’d cut the butter and just sprinkle the cinnamon on the strawberries or mix it in the yogurt. I used Greek yogurt, but will try it with Honey yogurt and omit the brown sugar next time. Excellent start to a healthy breakfast or dessert! I do have to say, I love strawberry pretzel salad, and having lived in both North Carolina and Minnesota (3 yrs in each), no one can hold a candle to Minnesotan jello salads!! OHOOOOOOO! FAVOURITE FOOD SWEET, NOT MUCH SALTY . I love Strawberry Pretzel dessert. Now I won’t have to wait for a picnic or pot-luck to enjoy it. Thanks!! Seriously, these are FREAKING AMAZING. would be nice touch with breakfast (maybe an omelet) Sounds so yummy! i’ve had the real strawberry pretzel salad at pot lucks and oh, it is so delicious! Have that recipe from a church member but have never made it. I will make this one for me and DH..Can I use strawberry flavored yogurt in your recipe? I’m going out and buying strawberries this weekend if not before and attempt to make this for us. Love fresh strawberries and the pretzel twist. Oh my this was amazing! I’m a lazy cook and I was looking for a way to finish strawberries and yogurt sitting in my fridge. I used peach flavored in one and blueberry in another and only a tablespoon of butter in the pretzel crumb. It was the bomb! Thank you so much for sharing this! My husband finished it in minutes! Desserts are always must have on the table. I love your recipe, I can even prepare this with the halp of my kids, it’s a great and fun family bonding. ohhh my goodness!! yum! I am doing an upcoming post on strawberries and would love to feature you! (I would link back to your site and include a photo)! We were just in the Netherlands staying with Dutch friends. They did a BBQ to celebrate a birthday and my Dutch friend (who was my exchange student 30plus years ago!) asked me to make “something American with jello”. Lots of pressure to represent a whole country who with one jello dish! But I made this (the full 9 X 13 version) and it was a wonderful hit! Everyone wanted the recipe and there wasn’t a bite left. Food diplomacy!! Such a great dessert! I love it too. Omgosh, I was just talking to my mom the other day how much I loved Strawberry Pretzel Salad growing up – I haven’t had it in years!! 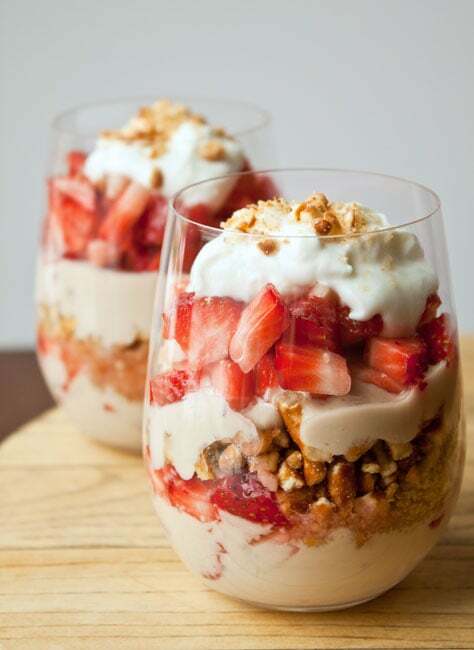 Great idea to make it in parfait form… I am going to try this! One of my favorite recipes of yours! So yummy! This snack looks not only delicious it is but also healthy. Can not wait to make one!Thanks. Strawberry pretzel salad is literally my *favorite* thing ever!! Excited to try this healthier version! Do you think using greek yogurt would affect the taste much?